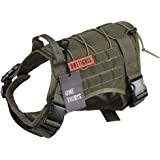 [CUSTOM- FIT]: No Rub As well as Escape-proof; Harness was designed by Putting 2 Individual Components Together ,Offer 4 Position Adjustable ( Shoulder ,Chest ) ,Free adjust Properly ;Make Sure This Harness is Fit Well to Your Dog. 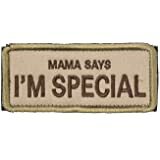 OneTigris Original Patch Tactical Morale Military Patch "Mama Says I'm Special"
5.0 out of 5 starsThe best harness for large-breed dogs! 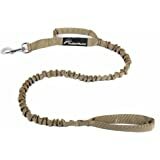 I bought one of these and another brand's harness at the same time for my two Great Danes. Between the two, the IceFang was the clearly superior harness. Not only was it more adjustable to fit the different contours of the dogs, it just fit better. I assume this is from a better cut or design. It doesn't rub or ride, which helps keep their fur in good order while not irritating the dog while wearing it. 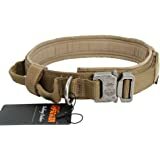 The metal front buckles offer a confidence that they wont break under their extreme pull, and the no pull ring in the front has helped me train them not to pull on their leash. I especially appreciate the breathable webbing on the underside that helps keep them cool in the summer. The sizing seemed to be pretty spot on. My dogs chests were 38 &39 inches which called for the XL size. I only had to make small adjustments to the straps once I received it. 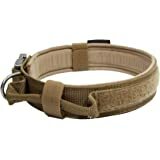 Overall, it is a fantastic harness that I would highly recommend to any large breed owner. Bought the XS for my cat. He's a big cat and it fits him perfectly, Very well made. Great value for the price. 1.0 out of 5 starsPit bull buyers beware!!! Seemed like a nicely made harness.... 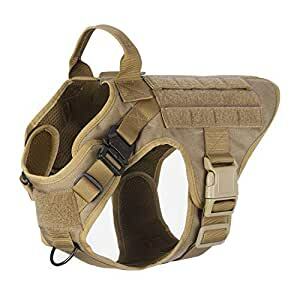 But then the second time I took him for a walk he broke the sewn in threads holding the top of the vest tie up bracket!!! Bracket supposedly rated at a 1000 lbs! But the sewn in part holding it must only be rated a little above 100 lbs!!! I you have a pit or Mastiff... I would recommend something stronger!!! If anyone has an answer for helping me find a harness that the tie up wont break or come undone please let me know!!!! 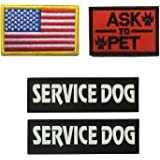 I just received this today and have only fitted it to my 143 lb., 19 month old Cane Corso (35" around hisntorso just behind the armpits). The fit seems fine so far...will update more later, but wanted to be sure and share the picture now for size reference for others. 5.0 out of 5 starsGreat quality product! Absolutely love this vest. The quality is definitely top notch. Even rivals the combat gear we’d use in the Marine Corps. Great product and I’d recommend this to anyone! My Weimaraner has had anxiety/trust issues and I prefer people not to pet her as I train her to remain calm around strangers. 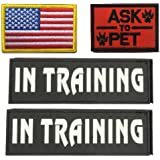 This was a perfect way to throw some “Do Not Pet” patches in a way to get that point across.